If you are struggling with a difficult situation at home, running away may seem like the only way to escape. In fact, that’s why most teens run away — to leave behind physical or emotional abuse, school problems, peer pressure, family conflicts, or drugs and alcohol. No matter how bad things get at home, running away isn’t always the answer. You might really need to get out of your current living situation, but that doesn’t mean you have to do it alone. Instead, talk to someone you trust, or contact your local Safe Place program for help. Before running away, please take advantage of available resources and consider the alternatives. National Runaway Safeline (NRS), a “Knowledge Partner” of NSPN, provides valuable information readily available to youth. The quickest NRS resource is the hotline. By calling 1.800.RUNAWAY – or – 1.800.786.2929, you will immediately be connected with a compassionate representative who is ready to listen to your story and help create a plan with you. My youth may or already has run away. I need help talking to my youth. What to expect when I connect. Tips for parents and guardians. Resources for parents and guardians. 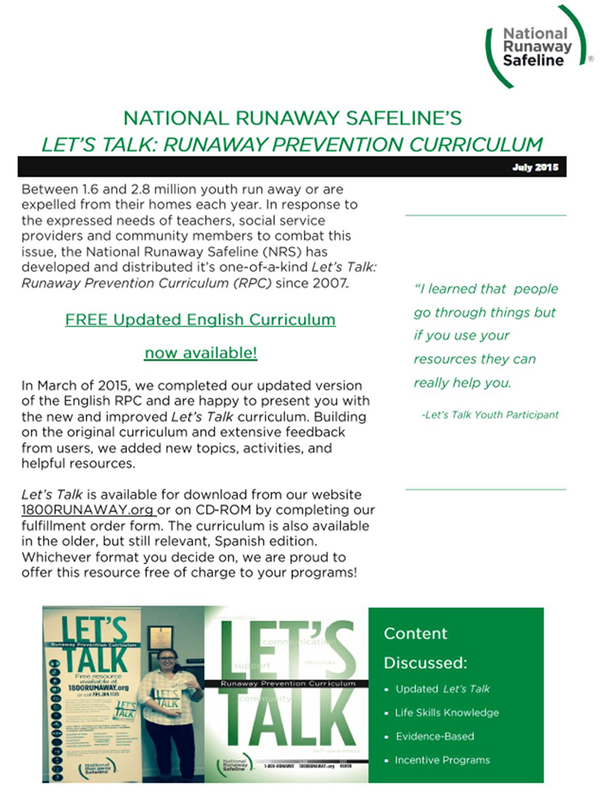 NRS also provides the Let’s Talk: Runaway Prevention Curriculum, a free, evidence-based, interactive, 14-module curriculum. This curriculum helps educate young people about alternatives to running away as well as to build life skills. Module 7 of the curriculum helps teach participants about National Safe Connections. This module highlights Safe Place and helps define what a safe place looks and feels like to youth. This unique prevention guide helps youth resolve problems without resorting to running away or participating in unsafe behavior. You are not alone. Please consider all the options before resorting to life on the streets.